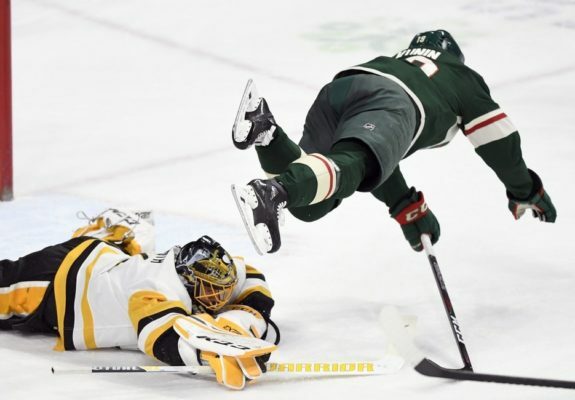 ST. PAUL, Minn. — Phil Kessel had a goal and two assists, and Sidney Crosby added a goal and assist as the Pittsburgh Penguins kept rolling with a 3-2 win against the Minnesota Wild on Monday night. Given their first power-play, the Penguins tied the game with Kessel sending a pass through defenceman Ryan Suter’s legs to Crosby alone on the back side for an easy tap-in goal. Minnesota had 13 shots in a scoreless second, including several in which DeSmith made highlight saves. At one point, defenceman Jonas Brodin was sent in alone on a pass from Zach Parise, but DeSmith poked the puck away before Brodin could get a shot.